Yesterday was the first day of our semi-vacation to Bloemfontein, a city in the the Free State province of South Africa. The plan was for us to catch a 06h30 flight to Johannesburg, then hire a car and drive about 400km to Bloemfontein, with three hours to spare before the Spain vs Iraq Confederations Cup football match being held at the Mangaung stadium. We stopped packing at about 1am yesterday morning... and woke up at 3am to finish packing. (Note to self: don't catch a 06h30 flight, ever). We arrived at the heavily congested Cape Town International airport, where queues were doubling back on themselves and stretching far out of sight. Through much running and scrambling we managed to board the Kulula plane on time... and then sat patiently for an hour or so, waiting to taxi to the runway. It turned out that the reason for our wait was that a micro-switch controlling the aircraft flaps had malfunctioned. After much investigation the pilot announced that we were to disembark, as it would take some time to repair! Argggghhhh! Not only was this inconvenient, but the three-and-a-half-hour delay would cause us to miss the football match - the whole reason for our trip! We sat in the airport lounge to drink a depressing cup of coffee, and in the midst of our disappointment and anger at the situation, we hit upon a plan. Kerry-Anne checked online and found that Mango, one of only three operators that fly to Bloemfontein, had an 11h15 flight that would fly directly to Bloemfontein, arriving in time for the match; while I went to find out whether we could get our baggage off the Kulula flight before they started boarding again. Some quick talking from our side, and quick thinking by Ameen Sabardien (one of the Comair supervisor-type guys), got our baggage removed from the Kulula flight just before it was to depart (in fact, the boarding doors had already closed!). We purchased new tickets from Mango (at a cost of around R1,100) while Ameen collected and returned our luggage to us and arranged for our car hire to be moved from Johannesburg to Bloemfontein. He was really amazing - when nobody else really wanted to help - he did. After all the racing we managed to make it to Bloemfontein in time to see Spain and Iraq take to the field. 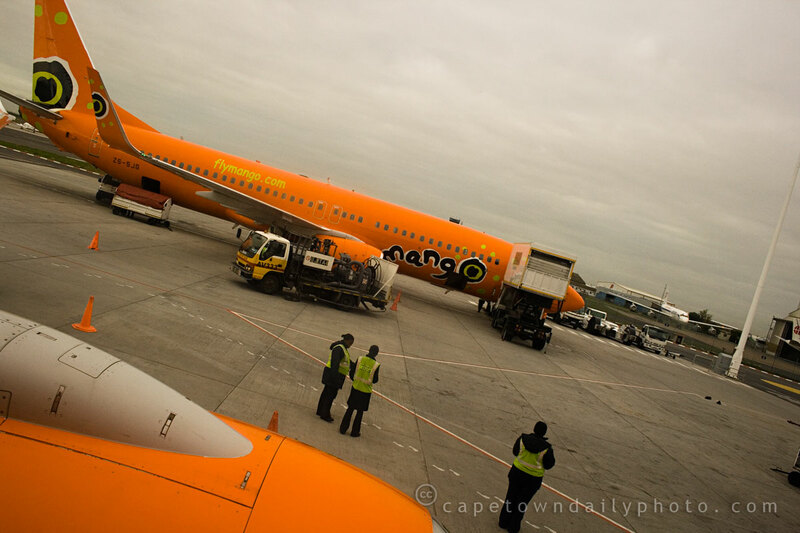 The only challenge that we now face is claiming the R1,100 for our Mango flight back from Kulula! Posted in General and tagged airport on Thursday, 18 June, 2009 by Paul.